Is constructed of steel and uses standard concrete blocks for Ballast on Flat Roof. 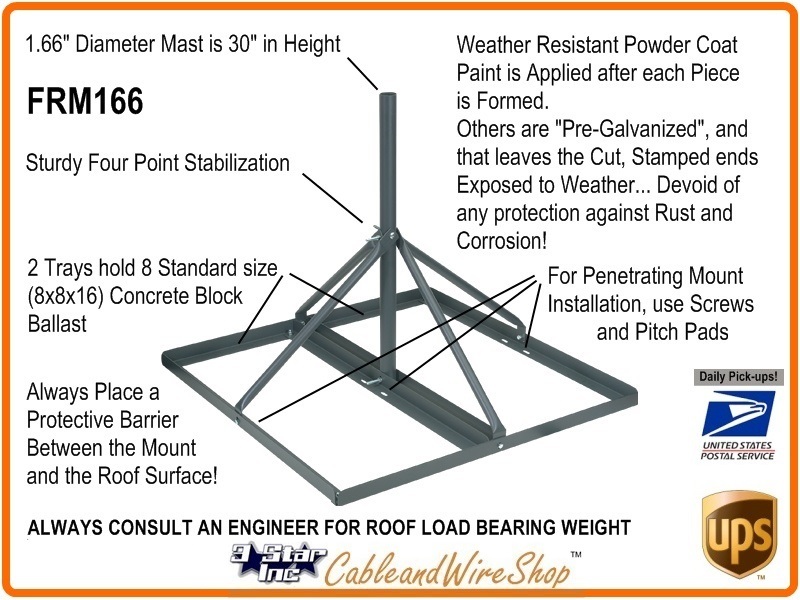 Mast is 30 inches in Outside Diameter and 30 inches in Height from Base. For use with DBS, antenna and satellite internet systems. Can be Used as a Penetrating Mount without Ballast. Compares to Other Name Brand Hardware at Half the Price. Note: This Non-Penetrating Mount Series from VMP is finished with a dark brown weather resistant powder coat inside and out that blends well with residential environments. The Standard is a 1.66 or 1-5/8 inches Diameter Pipe size in most Universal Mounts for Satellite Dishes. Whether Aftermarket or Service Provider supplied, this mount can accomodate even large Dishes for DirecTV (1 and 3 LNB only, the World Direct International uses 1.75" DIA Mast and the Ka/Ku HD Band uses 2" DIA Mast), Dish Network 500+/1000+, Dish 500 Plus, Dish 1000 Plus, DishPLUS, Dish Network TurboHD 1000.4, Dish 1000.2, Dish Network 1000.4, DishPro, 105 SuperDISH, 121 SuperDISH, EchoStar Technologies Corporation, most FTA Free to Air and DBS Direct Broadcast Satellite Dishes that use the same Diameter Mounting Tube for mounting Dishes up to 39 inches. In addition, it can be used in mounting some smaller PCS, Cellular, Broadband Wireless, Wireless Internet and Two Way Antennas. I have enjoyed Installing this product line for Dish applications from Business and Internet on the tops of tall buildings to HD TV and zillions of channels for in-home use. And as with all items in this Product Line, Screws and Pitch Pads are included for Bolt-down versus Ballast applications. The Length of the mast is 30 inches based on engineering that incorporates consideration for typical Satellite Antenna Wind-load versus the Ballast that would keep either on target with minimal deviation and flex. As with all Ballast mounts, Structural Engineering consultations are recommended for all Roof Applications.